EDIT: Unity 4.2 is now available for download, and you can read a more comprehensive feature list on the official blog. Mechanim avatar creation API: no longer need skeleton at time of build, can be applied to new skeleton at run time. Helps with player-created avatars. Anti-aliased render textures: useful for occulus rift because VR headsets use a render target per eye, so now they can be antialiased. Shadow batching: reduce draw calls of shadow-heavy scenes. ~50% reduction in shadow rendering in unity-internal shadow-heavy scenes. Headless linux player: make linux servers from your game code. That’s pretty cool. Fixed problems where lots of frequent garbage collection could interrupt audio. You can cancel builds! And asset imports! And switching platforms! Presets for colours, curves and gradients in the editor. Handy for reusing data across components. Memory snapshot view now tells you the reasons an asset is loaded. The example shown is a texture loaded because of a material because of a bunch of meshes. Of those new features, I’m excited by the headless player support. That’s going to be great for client-server games that want to run on AWS or something. The presets also sound interesting – I’m a huge fan of animation curves, and anything that increases their functionality is great by me. And I could have used the more detailed memory snapshot tool while optimising Sonic Dash. So looking forward to the release of 4.2, and I hope you are too. I’m not sure how much more I’ll be writing about context behaviours (no, I still haven’t really decided between context steering and context behaviours), so I’ve made this post as a way to wrap everything up. I made both of these blog posts into a talk at GDC 2013 (see second half of video) as well as going into much more depth in an AIGameDev broadcast. I’ll update this post with any more articles and how they fit in. After my GDC talk, Treff on twitter sent me a link to a paper from the late 90s by a researcher called Julio K. Rosenblatt. It had some similar ideas to my context steering technique. I thought I’d discuss the differences and similarities here. The merging of votes doesn’t happen at the decision space. 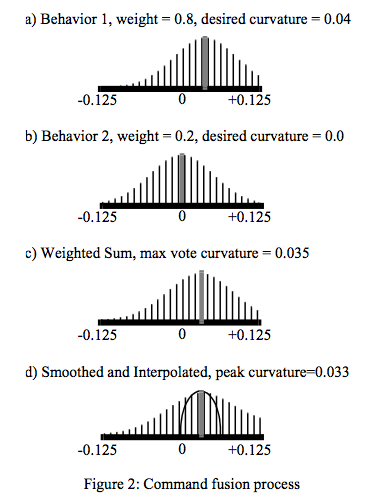 From the diagram below, it seems like there’s some metadata about the curves used to write votes. Notice how a central curve is created from the two behaviours, rather than one small peak and one large peak. This is essentially a rasterized version of steering behaviours combined through weighted averages. I think this all adds up to a rather expensive way of implementing steering behaviours. This is somewhat understandable as this paper came out just as or just before steering behaviours were starting to become popular, so the author may have been deep into his research by the time he heard of them. There are several interesting aspects to the paper. It mentions that the behaviours all update at different frequencies, and the arbiter may receive votes at any time. This is great for those behaviours that are either low-priority or don’t change a lot, and allows easy parallelisation. DAMN uses multiple subsystems, each asking the behaviours different questions. A speed subsystem (or “arbiter”) works out how fast to go, a Turn arbiter decides on direction, and because this is originally for controlling robots, a “field of regard” arbiter for working out where to turn the cameras. In comparison, context behaviours tend to use the maps for primarily computing a heading, then speed is calculated as a secondary factor – normally from the highest magnitude of interest or danger encountered. Splitting up like this makes for better separation of concerns, at a possible redundancy cost depending on implementation. It’s an idea worth exploring. The paper talks about structuring behaviours using a subsumption-style approach, with high-frequency basic behaviours providing a “first level of competence”, built upon with more complex, possibly lower-frequency behaviours later. I like this way of thinking about behaviours. You can build your higher-level behaviours to be allowed to fail, knowing you’ll be caught by the lower-level systems. There’s also some dense but potentially interesting passages that discuss methods of trying to evaluate the utility of each decision. It looks interesting but is a bit over my head. If anyone’s got any further information on what they were talking about, please share it in the comments. In summary I don’t think there’s a lot of similarity between context behaviours and DAMN behaviours, beyond the superficial. Context behaviours could take heed of DAMN’s separation of concerns and the way polling is reversed, possibly making for better structuring of code. DAMN could do with adopting some of the simplicity of steering behaviours, or if required, the constraints and predictability of context behaviours. As part of AIGameDev’s regular live broadcasts, Alex will be talking to me at 9pm BST (GMT+1) tonight about steering behaviours, and my context-based improvements. Click here to tune in!